When Andy Mumma was a barista, he often hated the bar spaces he worked in. Many hid the baristas behind a wall of espresso machines and grinders, cramming them in a corner, surrounding them with to-go cups and syrup bottles. It created a barrier that divided the customers from the baristas and made quality interactions impossible. It also made for bad barista work. A hidden barista, Mumma found, had a messy station and often careless preparations. 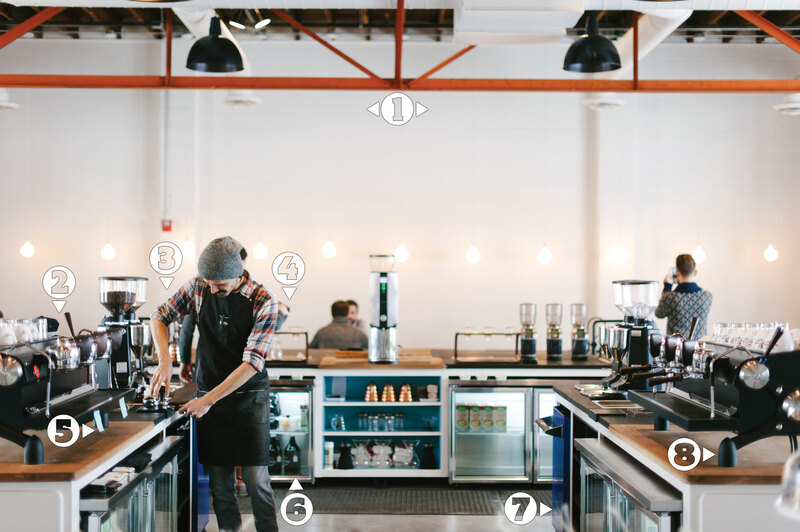 That ethos showed up in his first café, which opened in 2011, but his recently opened second shop in Nashville takes that open design to an extreme and then adds a level of symmetry that Wes Anderson would find compulsive. 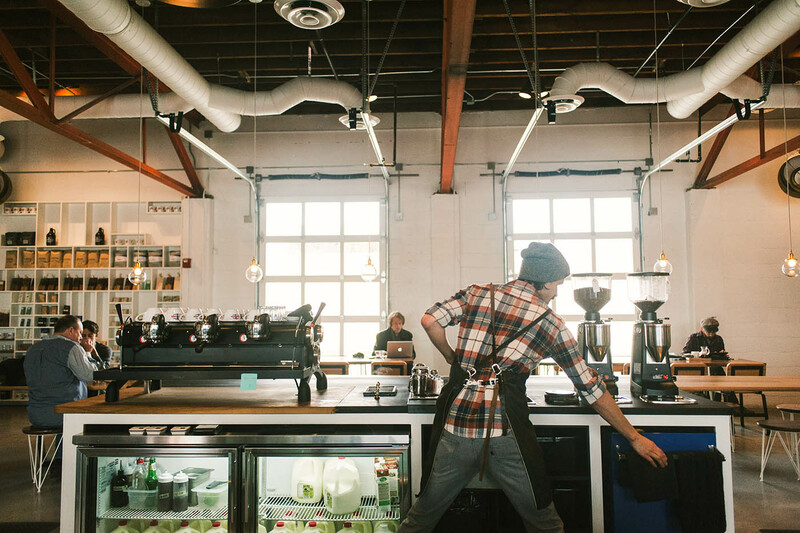 Built in the erstwhile Golden Sound recording studio, Barista Parlor at Golden Sound has plenty of floor space to play with and Mumma put the bar in the center, an increasingly common design decision in mid-sized cities. His bar, though, isn’t an island. It’s a square archipelago made up of an island for ordering and pastry displays, two parallel espresso bars, and long brew bar. The lagoon between the islands has enough space to let a cashier walk to the dual pour-over stations without disturbing the mirrored baristas. The huge space will house more than a café. Next year, Mumma will begin roasting. The café’s multi-roaster model will remain, with Barista Parlor’s beans joining some of the best roasts in the country. 2. Under the Skin: The Golden Sound café has a red, white, and blue (think Speed Racer) color palette. As this espresso machine takes its inevitable dings and scratches, each blemish will show as red under the black powder coat. The other machine will show blue. 3. Custom Islands: With customers able to see into the bar, there’s no way a bus tub or garbage bin can go on the floor. Spaces for tubs and trash are built into the bar. Even scales are hidden away in cutouts on top of the bars. The blue boxes are tool chests with all the gear to keep the machines in order. 4. Dueling Pour-overs: Clive Coffee’s V60 stands do most of the pour-over work, but Chemex, Solo, and nel drip are available as well. 5. Post-it Notes: Every order goes on a sticky note and is sent to the espresso or brew stations. 6. Towers of Cold Brew: Eight Yama cold-brew towers, divided in mirrored sets of four, naturally, produce coffee kept in growlers in the far fridges. 7. CO2: Hoses attached to CO2 tanks are also hidden in the bar, ready to charge signature drinks and then go out of sight. 8. Slayer, Redux: The second espresso machine usually shuts down after the lunch rush. After that, it’s used for training and once the roastery is operational it will be used on trials of new roasts. —Cory Eldridge is the editor of Fresh Cup.